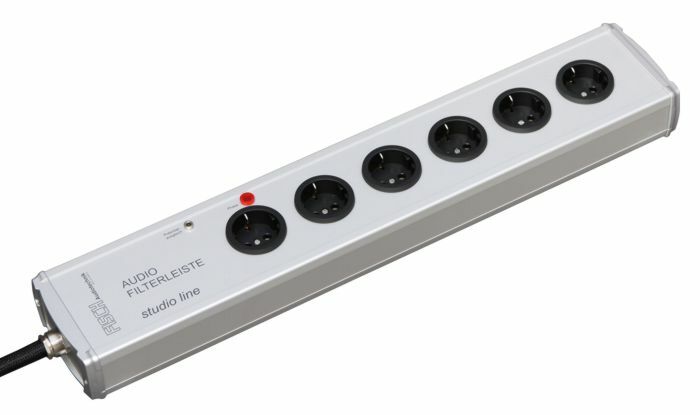 A symmetric input filter protects all connected components against all wire bound distortions, coming from the mains. as this is a common attribute to all FISCH power bars. That is to ensure that the music never will be limited by any loss of dynamics. The same attention has been paid to the very high frequency range. The interference suppression reaches the gigahertz range. That is important for the attenuation of interferences coursed by mobile phone and other modern wireless services. The necessary filter technology has been adopted from our top of the line model, the “reference line”. Only the “on-site” filter technology made it possible to archive on all outlets the same high frequency attenuation. that is what a good power source is made for.